Yes, it's true. The Wimpy Cruiser used to be a very wimpy flyer. I never freaked out during the flight or anything...no planes have ever turned around on my account. But I used to be nervous flying. And I don't think I'm alone. And since I don't drink or take drugs (which certainly come in handy for some people in handling this little picadillo), I was left to my own devices to figure out how to settle myself down. Oh, you can spend hundreds of dollars for seminars which teach you how to manage the issue. I understand they mainly teach you to close your eyes just before take-off, and go to your "happy place." To basically pretend you are someplace else. Well, frankly, this always seemed silly to me. There's no denying where we are, folks. During one pre-flight check a few years ago, as my heart began to pound with the scary, mechanical noises and jolts that shook the cabin as they loaded the luggage below, I came upon an epiphany. I realized immediately that I had the answer to my problem! My own 8 step plan became immediately evident to me. I was cured! 1) Instead of DENYING that you are on an airplane (because really, who are we fooling here, anyway. Not you!) and going to your "happy place," scratch that. Your happy place is no longer a white sandy beach with palm trees gently wafting above. Your happy place is on that damn plane sitting in that damn seat! 4) This is a big one: you need to completely accept that you are not in control. The pilot, crew, air traffic controllers, mechanics who last worked on the plane --- THESE are the people controlling your fate. So just give it up. If the plane's going down, it's going down. And there's nothing YOU can do about it. 6) Now, while you may not have any control in whether the plane crashes or not, in the case of a crash or a hard landing, you may need to save yourself. So for the love of God, instead of going off to happy land while the stewardess (sorry, "flight attendant") gives you instructions how to exit the plane and safe your life -- be original and actually LISTEN to her. 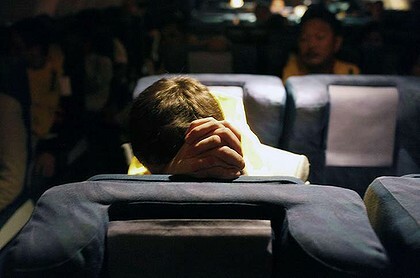 Take out the cardboard directions in the back of the seat in front of you (the ones you always ignore), read them, and figure out how to get out of that plane as fast as possible, should the unthinkable become necessary. 7) OK, now the plane is backing out, and you're heading out to the runway. This is often the most nervous time...waiting...waiting...waiting. For entertainment, stand up and look back at all of those pathetic sacks, sitting there with their eyes closed, pulses racing, trying to fool us into thinking that they're asleep while they're really frantically trying to go to their happy place. Pity them. There is nothing you can do for these folks. Wish them well and move on. Now. Sit back down and fasten your seatbelt. You're in the for the ride of your life! Think of yourself as an astronaut during the countdown of a rocket into outer space. Feel the revving of the engines. Marvel at the amazing, powerful technology! Get into it! You're so lucky to be here! Think how many humans never even get the chance to go up in a jetliner. But not YOU! You're one of the fortunate ones! 8) OK, we're hurtling down the runway now. Make yourself LOOK OUT THE WINDOW. Watch the whole thing in amazement and excited awe. Try to have sympathy for the guy next to you, sweating bullets and cramming his eyes shut in panic. He's missing the whole thing! Here's the best part. FEEL the centrifical force as the jet hurtles forward. Be amazed at the power which is pressing you into the back of your seat. Look outside again. Smile at yourself. As the jet lifts off, look down as far as you can. Press your face and palms against the glass as a 5 year old would. Again, marvel at the sight -- at the simply amazing fact that you are even here doing this at all! The takeoff and first few moments of flight may be the most horrifying, but they are also the most beautiful. Watch the land and ocean spread out below you. Watch the sunrise and the clouds as you slice through them. It's a spectacular sight -- and lucky you: you get to see it, in person! So -- that's pretty much the program. FULL IMMERSION. It worked for me like a charm and I apply it every time I fly. Now, this program also comes in handy during my sailing adventures as well. For instance, during our one night passage to Isla Mujeres, Mexico from Belize, we experienced some big wind and even bigger waves and swells. So instead of going down into the cabin and being bounced around the interior of the boat like a ping pong ball, trying to "deny" that I'm out at sea in the middle of nowhere being battered all over hell -- I choose to place myself at the highest, most visible spot in the cockpit -- face forward, and ride Espiritu like the bucking bronco she is. Not only does this help squash my fear, it also eases seasickness. (Just a tip). You can see the growing wave heading right towards Espiritu in this photo. These were big ones. I had to trust that Espiritu would propel over the top of this one, just like she has every other one of the thousands of waves she has sailed over during her 30 years at sea. How fortunate I was to be here, experiencing the overwhelming power of the sea. So, give my 8 point plan a try. Let me know how it works! Chris and I remain anchored at Isla Mujeres, Mexico. We'll be looking for a weather window to make the 3 day sail north to the Florida Keys.